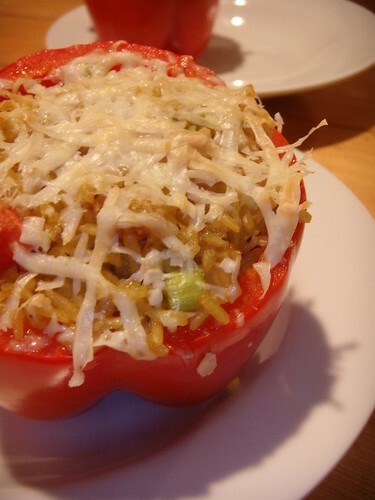 curried stuffed red pepper, originally uploaded by aarn! +30th June, 2008+. made some curried brown basmati rice with cloves, garlic, onions, and turmeric, added some fresh tomatoes and green onions and spooned it into a fresh red pepper with romano and fresh mozzarella in the bottom and shaved some romano on top. threw that in the oven for about fifteen minutes, just to melt the cheese and lightly cook the pepper. wasn't interested in eating a mushy red pepper, so it was kept crisp and fresh.